Is that all you got out of this book? I understand collectibles are your focus, but I felt this book was a memorable study of everything about Joe's and Marilyn's inside lives. It was great to learn about how Joe rescued Marilyn and was the only one not to use her. 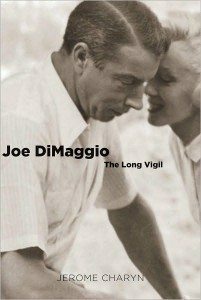 The author could have done so much more, showing how autographs (or lack of) represented DiMaggio's attitude toward fans — his adoring public. For years, his sister ghost-signed his fan mail. Sorry, I'm still disappointed. Tom – thanks for your honest review and hosting a stop on the blog tour. It's interesting to read everyone's take on the book – some focus on the romance between Joe and Marilyn, some pinpoint the baseball moments like Joe's 56 game hitting streak, etc. As a baseball collector, you zeroed in on Joe's later years on the autograph circuit. There really is something for everyone in its pages. What "new" did this book bring to light that previous books haven't? I've seen a lot of books lately about DiMaggio, Mantle, etc. that seem to be capitalizing on the name they're writing about but offer little else in the way of new information. Tom, Jerome Charyn followers appreciate your having giving your thoughtful "take" on the book. Thanks for being a fan of Joe DiMaggio.